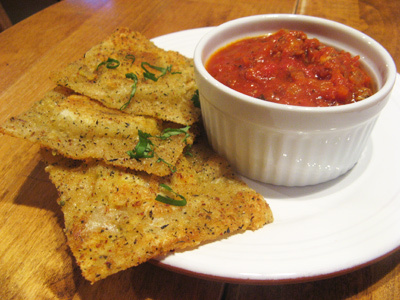 I hinted that I had another idea for the ravioli and what do you know, it was “oh my gosh” good! Joe said I’ve made these before with frozen ravioli, but I don’t remember. I think I would remember if they tasted this good. Anyway, getting back on track . . . 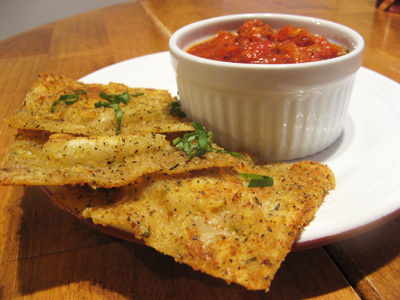 I googled ravioli recipes to see what everyone else was doing with them and came across several toasted ravioli that looked so tempting. I already had the ravioli and sauce made so it made sense to try and see if I could make these like those pretty photos I had been looking at. Since my ravioli was made with won ton wrappers they fried up light and crisp. So tell me, which way you prefer ravioli? Toasted or steamed . . . I had 18 ravioli left. I poured about a cup of bread crumbs into a bowl and added some Italian seasoning and grated parmesan cheese blend. I accidentally dumped the Tuscan Sunset so it was seasoned real good. Probably a couple teaspoons would be about right. 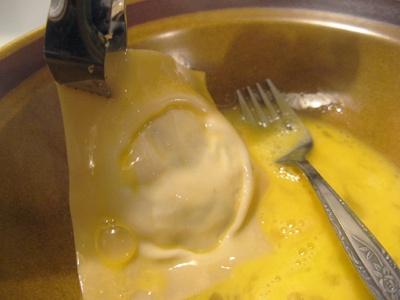 And a beaten egg to dip the ravioli and hold all those crumbs in place. First dip a ravioli in the egg wash.
And into the crumb mixture. Make sure to coat both sides equally. Drizzle some olive oil in a non-stick skillet just enough to coat the pan and add a few ravioli at a time over medium heat. They will toast quickly within a couple minutes. When you start to see them brown on the bottom turn them over. I used small tongs to gently lift them and turn. Nicely browned and only a minute more to brown the other side. Each batch will need another drizzle of olive oil and you may want to turn down the heat if they start to brown too quickly. And in no time you have a toasty treat. 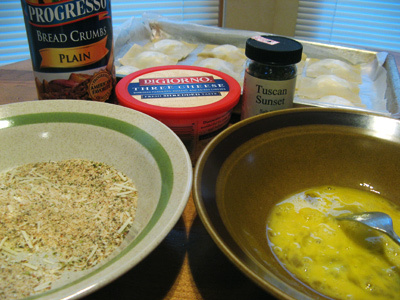 Combine bread crumbs, Italian seasoning and parmesan cheese together in a small bowl. Beat an egg in another bowl. 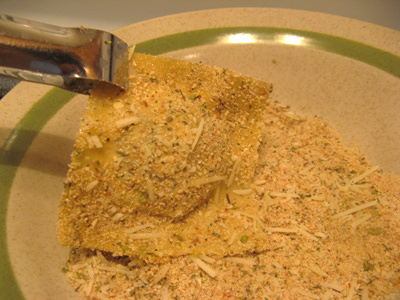 Take ravioli and first dip in egg, then in crumb mixture. Heat a non-stick skillet over medium heat. 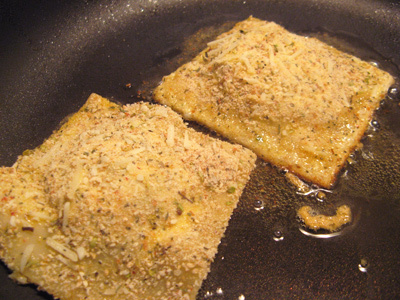 Drizzle olive oil to coat bottom of pan and place a few ravioli in the pan at a time. Pan fry for a minute or two until the bottom edges start to turn brown. Gently turn over to toast the other side another minute more. 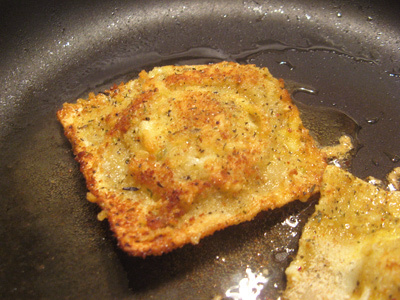 Remove to a warming plate while you fry the remaining ravioli. 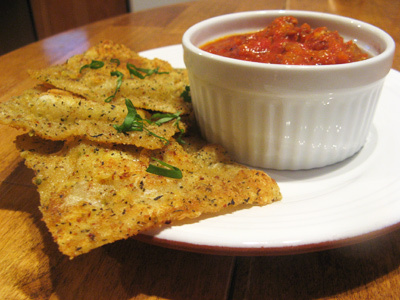 Serve with Spicy Italian Sauce.